Cauliflower is so versatile. I have made “bread sticks” from a head of this vegetable. I have made buffalo cauliflower florets as well. Pizza crust. I’ve put it in stir-fries. I’ve made a tempura batter and fried them up. But…when my CSA bin delivered me another gorgeous head of cauliflower…well…I wanted to do something different. I have my go-to recipes…but I just wanted something different. With the magic of Pinterest and a recipe that I built around from Nom Nom Paleo…I took this beautiful head of cauliflower, mixed it up with some healthy fats and a dose of curry, cumin, and seasoning. Roasted it up in the oven…then topped it off with some fresh herbs. And the result…pure magic. Enough that I want to make it again…soon. I need more cauliflower. Preheat the oven to 450°F and move the rack to the lower middle of the oven. Place the florets in a large bowl and toss them with a generous amount of the oil of your choice (about 2 tablespoons). Add the curry powder, cumin, salt and pepper and toss until the florets are coated. Pour the seasoned florets on a foil-lined baking sheet and cover it tightly with another sheet of foil. Roast in the oven for 15 minutes, then remove the top layer of foil and continue to roast the cauliflower for 20 more minutes, flipping the florets every 8 or so minutes, until they are softened and browned in parts. 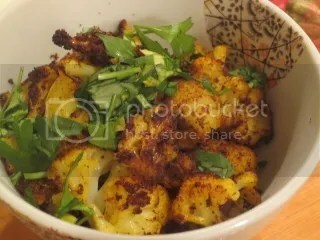 Plate the cauliflower and give each serving a squirt of lemon juice and top off with the minced fresh parsley. Serious flavor. Even Cathy was talking about the next time I made this dish. I was so happy with the way it turned out. It wasn’t too spicy, which worked in Cathy’s favor. Just the right hint of seasoning. Total perfection. Tender…delicious…and amazing. Liven up your cauliflower…I dare you! This entry was posted in Clean Eating, Entree, Food, Gluten-Free, Indian, Recipe, Side Dish, Vegan, Vegetables, Vegetarian by The Celiathlete. Bookmark the permalink.